AT SBBS we offer Pack-Tite rental services. PackTite Portable Heating Units safely eliminates all stages of bed bugs by heating contents up to over 120ºF for a sustained period. PackTite is a safe, non-chemical way to treat your personal items for bedbugs. Renting a Pack-Tite may be the perfect solutions if you have come into contact with bed bugs but have not yet introduced them into your home. Contact us for a rental quote or ask your inspector for details. PackTite™ is designed to work as a preventive measure for travelers, especially frequent business travelers. Many hotels have low-level bed bug infestations that are very hard to detect by visual inspection. 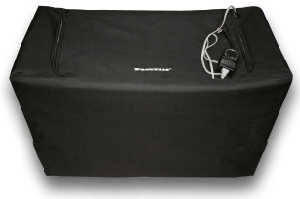 Careful travelers can place their luggage in the PackTite™ heater upon returning from a trip and PackTite™ will kill any bed bugs that have crawled into the luggage. Additionally, Packtite™ is an essential tool for those dealing with an active bed bug infestation in their home. Many items can not be placed in a dryer to kill bed bugs, such as shoes, dry-clean only clothes, sleeping bags, toys, etc… PackTite™ is the perfect pesticide-free way to gently rid your belongings of bed bugs! Easy to Assemble: Just a few simple steps and PackTite™ is ready to start killing bed bugs. Easy-to-Use Timer: Set your desired run-time. Orange light displays when complete. Temperature Sensor: Place deep in the center of contents to ensure proper heating. Usable Space: 30” W x 18.5” L x 15” H.
Washable Exterior: Outer cover is removable and washable for added peace of mind.